Contrary to what some industry observers expected, Mexico has no immediate plans to open up its natural gas sector, including access for private companies to explore or produce dry gas. At least, that is what Energy Undersecretary Juan Antonio Barges told a newspaper in Mexico City last month. "Definitely not" is the answer that Barges reportedly gave the Reforma newspaper when asked if Mexico would liberalize the dry gas sector. Barges subsequently would not comment to other media outlets, although an energy ministry spokesman did confirm to Reuters that the undersecretary had, indeed, said that no opening is planned "for the moment." Barges' comments seem to contradict expectations held by some people in the international oil and gas community, that Mexican officials would include opening of the dry gas sector as part of energy reform legislaton to be sent to Congress this fall. As recently as June, Energy Minister Ernesto Martens had indicated to visiting Canadian energy executives that a draft plan to open up the gas side would be ready by the end of this year. 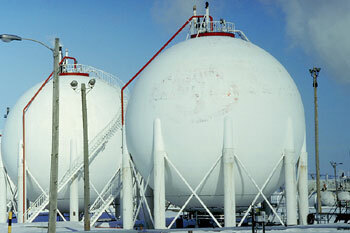 Those Canadian companies had believed that gas production by private and foreign firms could begin as early as mid-2003. One must be careful to properly analyze the content and context of Barges' remarks. Based on our own sources within Pemex, it seems that Barges was referring to right now, at this moment, which could be interpreted as a time period running from September through the end of 2001. However, he did not say never in terms of potential, direct involvement in dry gas E&P by private firms. Nor did he ever say that there will never be other, less strenuous steps toward encouraging private participation. Indeed, as stated in a feature article on Pemex's Northern Region that we are running in this issue of World Oil, officials are still actively evaluating a proposal to change the constitutional/legal framework to allow "multiple services contracting" by private and foreign firms for "field reactivation projects." This article is authored by Maclovio Yanez, Pemex E&P's subdirector for the Northern Region. We checked with Yanez's office, and his staff confirmed that despite the undersecretary's comments, the multiple services contracting option remains alive and well. Furthermore, they confirmed that the federal government is still preparing a proposal for submission to Congress by the end of 2001. It would call for an even wider opening of natural gas E&P to private and foreign companies. Pemex and the administration of President Vicente Fox certainly could use some outside cash to help maintain oil output levels and increase natural gas production. Pemex Director Raul Munoz said recently that his company must find a way to raise $33 billion for E&P projects over the next five years. Otherwise, he predicts that Mexican oil production could fall by as much as one-third from the current 3.1-million-bpd level. High investment levels are also needed to boost natural gas exploration efforts. The country is experiencing a boom in gas demand for electricity generation and other industrial uses, as well as for residential purposes. Pemex E&P has assembled a comprehensive five-year gas development plan, much of which is concentrated onshore in its Northern Region. For more details about what will take place in this region, we encourage you to read the feature article that begins on page 85. Cuban output hits a new high. Officials within Fidel Castro's regime are reportedly disappointed that Cuban crude oil production is forecast to fall 7% short of their 2001 target. Nevertheless, the country is making impressive strides toward greater output capacity and self-sufficiency. According to the Havana-based weekly publication, Granma International, output is now expected to hit 3.8 million toe, versus the government's 4.1-million-toe target. As of now, Cuban output is averaging 9,000 tons/day of oil (56,700 bopd) and 1.8 MMcmgd (63.6 MMcfgd). This compares to last year's output of 46,475 bopd and 55.2 MMcfgd. The 2001 figures represent 22% and 15% increases in Cuban crude production and gas output, respectively. Such a performance is remarkable for a country that, back in 1991, produced only 1,445 tons of oil (9,105 bopd) and no natural gas at all. Credit for the turnaround has to be given to the Ministry of Basic Industry's decision in the early 1990s to enlist the help of foreign operators, mostly Canadian firms, after the Former Soviet Union reduced oil exports to Cuba. At the fourth annual Congress on Geology and Mining in Havana last March, Basic Industry Minister Marcos Portal told attendees, "We had a choice. Commit suicide or share our riches. We chose to share our riches." More than 90% of Cuba's oil is produced from older fields along the northern coast. At these fields, the dominant operator--Canada's Sherritt International--and other companies, in cooperation with state firm Cubapetroleo, have employed increased drilling and modern production technologies to improve output. Cuba's domestic production will account for 40% of the country's energy demand this year. These supplies are also expected to generate 90% of Cuban electricity by the end of 2001, up from 70% earlier this year.